The 2015 MCAT is not only a newer exam but it’s also longer, in the number of sections and the time per section. Although the exam itself is just over six hours, which includes four sections 90 to 95 minutes each, the breaks in between sections bring it a total of seven and one half hours. Even if you studied thoroughly and are confident that you understand all the material, if you don’t have enough endurance for a 7.5-hour test, it won’t matter how much you studied and how well you know the information. If you start to get tired and burn out somewhere in the middle of the exam, your potentially high scores will be sacrificed. So how do you prepare to take a 7.5-hour exam without burning out? In addition to studying the resource material for the MCAT, it is essential that you gradually build up your test-taking endurance for this exam to ensure that come exam time you are comfortable, confident and mentally present for the entire exam. Building endurance is a gradual process. It doesn’t happen in a week or even a month, but over a long period of time. If you rush it, you will burn out from the process as well! My advice is to focus on these two phases. Get comfortable sitting and studying for 95 minutes in one shot. Get comfortable doing this four times successively with short breaks in between. Three of the exam sections are 95 minutes and the Critical Analysis and Reasoning Skills (CARS) is 90. So basically you have to be able to sit and mentally operate for four 95-minute test sections in a row without getting tired or burning out. How do you build your stamina for this? First you want to determine your baseline—how long you are comfortable sitting and studying before any endurance building. The best way to get an endurance baseline is to take the AAMC sample MCAT, a full-length sample test that simulates the real exam complete with 230 questions presented in four 90-95 minute sections. This will also help you determine your comprehension level of the material before you begin studying. As you take the sample exam, pay attention to when you start to feel the burn out for each section. Do you make it through the first section easily? If not, when do you start feeling drained or tired—after 50 or 60 minutes? If yes, how do you fare in the second, third and fourth sections? Make note of how you did for each section because that will be your baseline and you’ll start from there to build up your endurance. The ultimate goal is to be able to sit for four consecutive sessions of 100 minutes each. I say 100 minutes even though the exam sessions are 90-95 minutes because you want to make sure your brain can operate past the required number of minutes so that as the time draws close you’re still operating at a high mental capacity. If your endurance is only 90 minutes, you’ll burn out by minute 95. But if your endurance is 100 minutes, you’ll be fine at minute 95. Let’s say that your baseline was 60+ minutes for the first section, 50 minutes for the second section, and the third and fourth sections were just brutal. We’ll tackle it two sections at a time and turn your study sessions into endurance exercises. Start with two back-to-back study sessions or newspaper strategy sessions that are 60 minutes each. Whatever topic you’re supposed to study for the day, make sure that for 60 minutes, you concentrate and study as if you were taking the exam. That means no distractions—no cellphone, no snacks, nothing except for you and your books/computer. 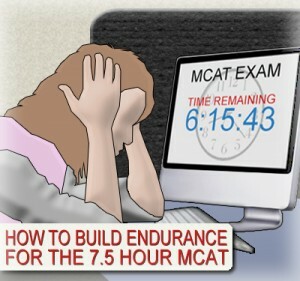 After 60 minutes, even if you feel fine, take a 10-minute break and do exactly as you would on the real MCAT—use the restroom, have a snack and some water, do some jumping jacks to get your blood circulating—then after 10 minutes begin your second session and try to study for another 60 minutes. You may do well the first session and start to wane during the second session but that’s fine. I want you to repeat this for at least a week, studying three or more times that week. When you feel comfortable studying 60 minutes with a 10-minute break and another 60 minutes, crank it up a notch not adding time, but another session. Take a 20-30-minute break after your second study session because the MCAT has a 30-minute break after the first two sections of the exam. Ready for that fourth session? Take another 10-minute break then add another session. Start the fourth session at 10-20 minutes, or whatever you feel comfortable with, and then slowly add to it. Keep doing this again and again as you get closer and closer to your MCAT test day. When your endurance for the last two sessions are at 100 minutes each, start adding minutes to your first two sessions until you reach 100 minutes on each of those. And don’t forget to take all the appropriate breaks. For example, if you have four weeks left and you need to add 20 minutes to each section, start adding five minutes a week per section. If you have eight weeks left, maybe add two and a half minutes per week per study session. Let me re-emphasize that you’re aiming for 100 minutes total per section so that you are capable of doing so and you don’t reach the 95-minute mark and mentally burn out. As you’re going through this experiment you should also be taking your weekly full-length exams which unfortunately is going to be seven and a half hours whether or not you’ve reached that endurance. This is more good practice and you can check your baseline each time, which should give you some encouragement when you see how much you’ve improved it. While you’re in the process of increasing your endurance you should also test how different foods affect your performance. Try a variety of foods that you think will give you energy and not make you tired. Pay attention to how you feel after lunch and ask yourself, does this food give me energy or make me feel sluggish? Do I feel hungry or satisfied? If something doesn’t work for you, omit it. If something works for you, try it again and maybe modify it the next week and the week after that so that by the time you get to your MCAT you know exactly what to eat for lunch that will keep you energized without making you feel tired and let you maintain that endurance all the way to the end of the Psychological and Sociological section of the MCAT. What recommendations do you think will help you the most?